NEW YORK--(BUSINESS WIRE)--Today Barbie® is honoring six Sheroes, female heroes who inspire girls by breaking boundaries and expanding possibilities for women everywhere. 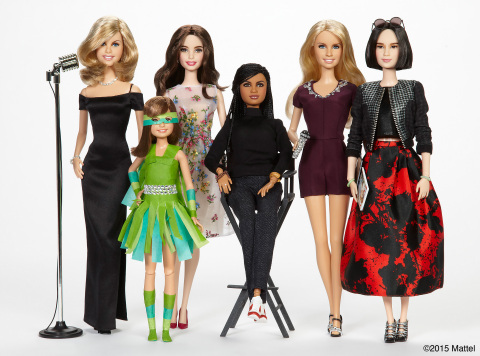 These women are being honored by Barbie at the Variety Power of Women Luncheon in New York City with a one-of-a-kind doll created in their likeness. Emmy Rossum: Golden Globe® nominated actress and spokesperson for Best Friends Animal Society, the only national animal welfare organization dedicated exclusively to ending the killing of dogs and cats in America's shelters and a leader in the no-kill movement. Kristin Chenoweth: An inspiration on Broadway and beyond, the Emmy® and Tony Award® nominee and winner also founded the Kristin Chenoweth Art & Education Fund volunteering with young talent in the arts. Sydney “Mayhem” Keiser: Five year-old fashion designer with work appearing in Vogue and signed on with major national fashion brand, J.Crew, for the collection 'Little Mayhem for J.Crew’ launching in June. The Shero celebration is a continuation of Barbie taking on a super hero role both literally and figuratively. Barbie set out to find what kind of Superheroes girls wanted and delivered a character uniquely for them in the Barbie™ in Princess Power property. The Shero celebration will culminate on National #Shero Day, Monday, April 27, where fans will have the opportunity to pay tribute to the Shero who has empowered them using #Shero #BeSuper and tagging @Barbie via Twitter, Instagram or Facebook. The Mattel family of companies (Nasdaq: MAT) is a worldwide leader in the design, manufacture and marketing of toys and family products. Mattel's portfolio of best-selling brands includes Barbie®, the most popular fashion doll ever produced, Hot Wheels®, Monster High®, American Girl®, Thomas & Friends® and Fisher-Price® brands, including Little People® and Power Wheels®, MEGA® Brands, including MEGA BLOKS® and RoseArt®, as well as a wide array of entertainment-inspired toy lines. In 2013, Mattel was named one of the "World's Most Ethical Companies" by Ethisphere Magazine and in 2014 ranked No. 5 on Corporate Responsibility Magazine's "100 Best Corporate Citizens" list. With worldwide headquarters in El Segundo, Calif., Mattel's companies employ nearly 30,000 people in 40 countries and territories and sell products in more than 150 nations. At Mattel, we are Creating the Future of Play. Visit us at www.mattel.com,www.facebook.com/mattel or www.twitter.com/mattel. ©2015 Mattel. All Rights Reserved.